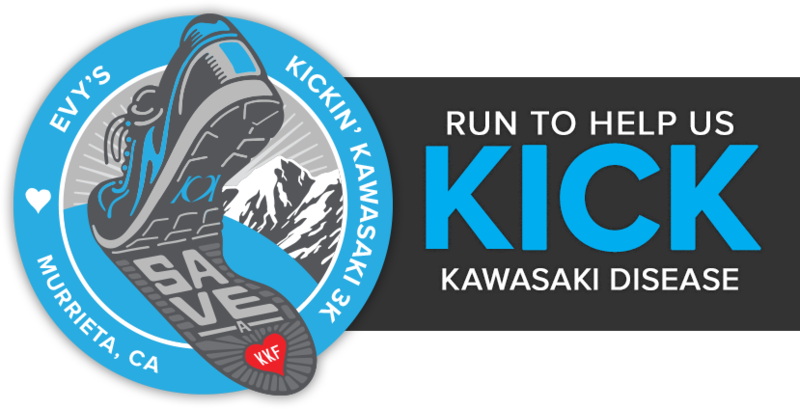 The Kickin’ Kawasaki 3K is a family friendly, kid-oriented race/walk dedicated to growing awareness and raising money to KICK Kawasaki Disease. You wear socks to run, right? So why not have fun with it? Sport crazy or fun or super cool socks and you might just win a prize – the crazier the better. Adult registration (10 & up) is $30 and includes an official race t-shirt, race bib and goody bag. Kids race registration (9 & under) is $15 and includes an official race t-shirt, race bib and prize at the event. You must be registered in one of these categories. To have a shirt included in your registration, you MUST register by May 3 at noon. T-shirts will be available to purchase for $15 on the day of the race. Packet pickup will be on race day. Consider arriving early to avoid lines. Interested in being a sponsor? Fill out the form at the bottom of the page. Saturday, May 11, 2019 | 9 a.m. INTERESTED IN HELPING OR HAVE QUESTIONS?